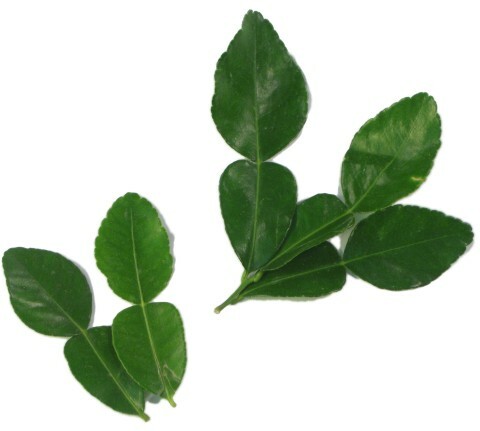 General Information: A fragrant and necessary ingredient in Thai, Laotian and some Vietnamese and Indian cooking, the kaffir lime tree has other common names, including kieffer lime, Thai makrut and limau puru. The leaves are known as bai magrood and are harvested from the evergreen tree native to Southeast Asia. The English name kaffir may be based on colonial slang and come chefs prefer to call this ingredient by it's Thai name, makrut. Characterized by the unique figure-eight shape of it's double leaf, this ingredient is also identified by it's distinct and explosive bright, floral and citrusy aroma. The upper side of the leaf is dark green and glossy and the underside is a lighter green with no sheen. The darker the leaf, generally the more mature and aromatic the ingredient. The leaves have a strong fragrance and flavor for which there is no ready substitute. If the leaves are to be used in a culinary application, it is best to break apart the pairs and remove the thick stem running centrally down the petiole. Stack several leaves and shred finely (chiffonade) to impart the most flavor to the dish. The leaves keep well in a plastic bag, refrigerated. They freeze well and can be kept for up to a year frozen, without losing any texture or aroma. Dried leaves are available from a variety of sources but prove to be a less than mediocre substitute for the fresh variety. Unable to ship out of Los Angeles for the past few years, Coosemans Shipping has created a relationship with Purple Hills Ranch, one of the leading producers of California-grown Makrut limes leaves. Now this rare ingredient has been treated to USDA specifications. Each lot shipped out of Los Angeles will have a tracking number assigned to a specific USDA certificate number. Packed in a one pound bag, Coosemans Shipping is delighted to be able to offer this unique year around program to our customers.